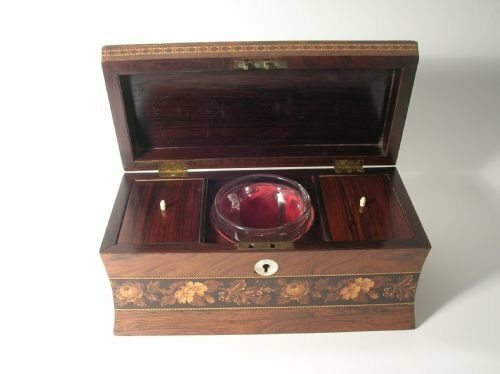 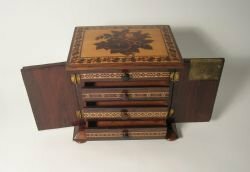 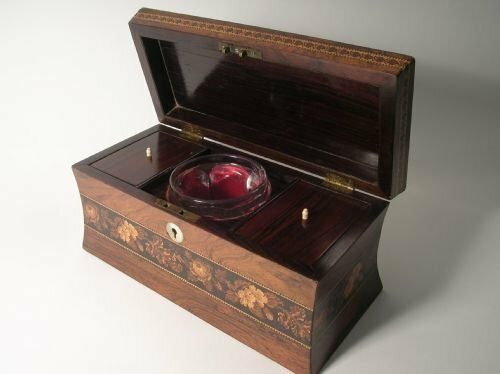 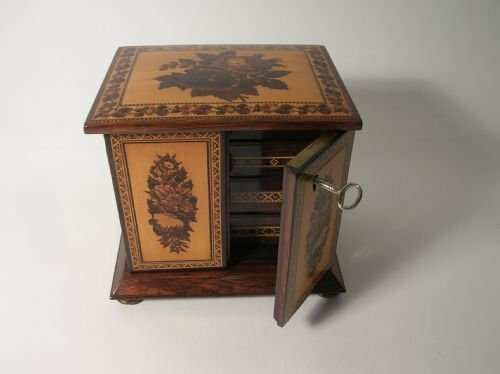 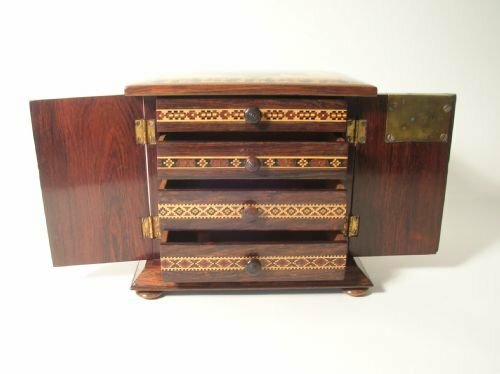 This exquisite miniature rosewood cabinet with 4 graduating drawers, a working lock with key, inlaid with end grain mosaic of flowers to the top and front, and end grain geometric patterns to the drawer fronts is in superb condition. 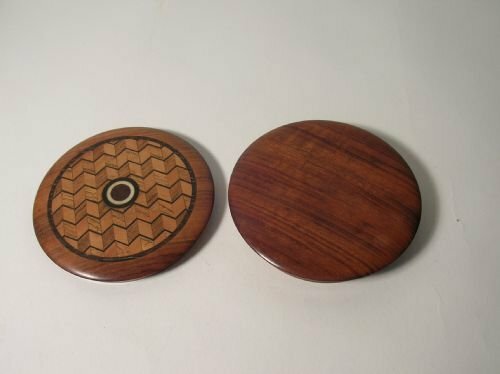 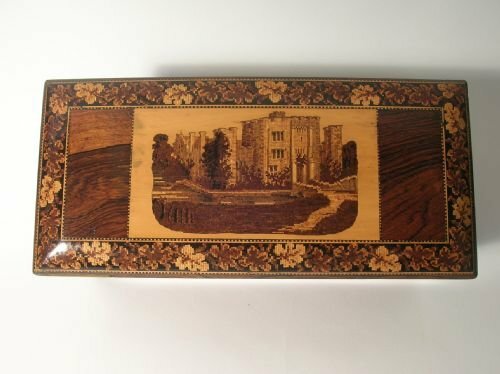 Purchased from the renowned authority on Tunbridge Ware, Dianne Brick, in 1990 and with the original invoice. 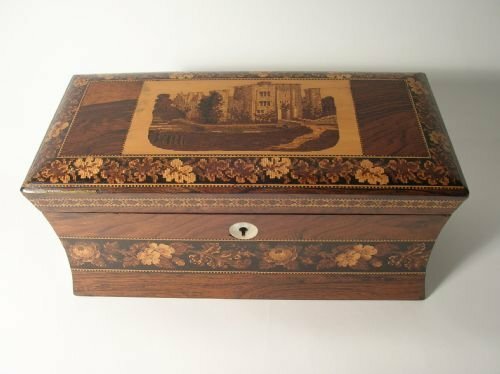 A fabulous two compartment rosewood tea caddy with a mosaic of Hever Castle on the top and a Tunbrige Ware end grain floral mosaic around the picture and the waisted centre, mother of pearl key escutcheon, small ivory handles to the lids and a central mixing bowl. 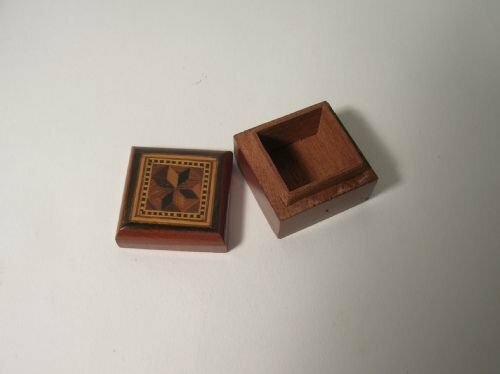 Generally in very fine original condition there are a few minor losses on the front left edge. 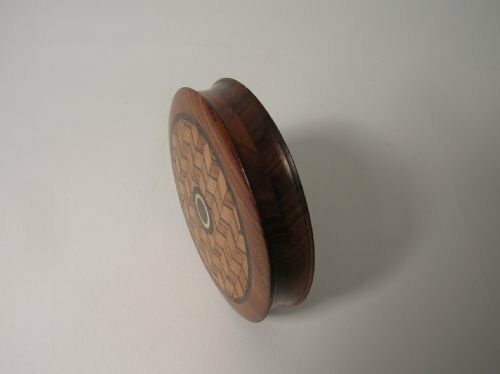 It is extraordinarily tactile and fits together with very fine tolerances requiring a satisfying amount of force to open and close it. 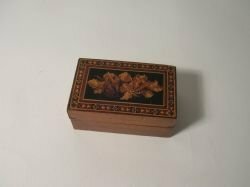 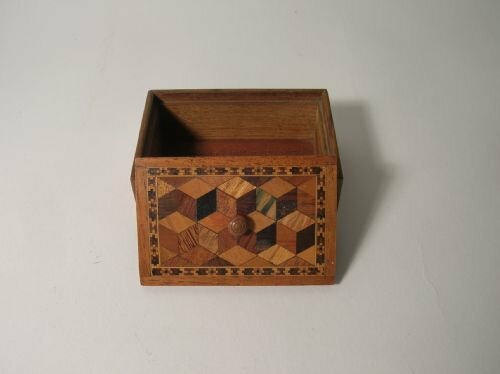 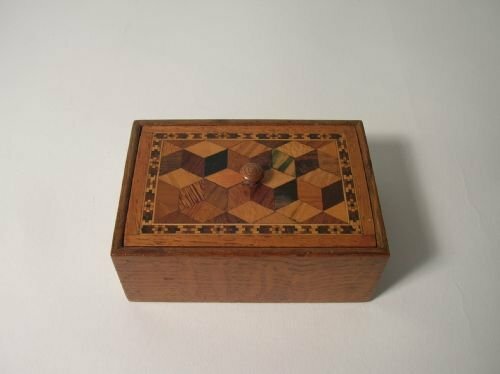 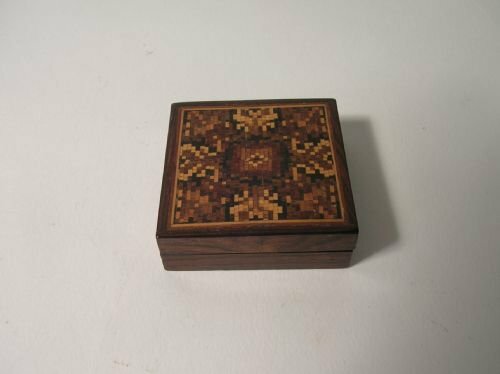 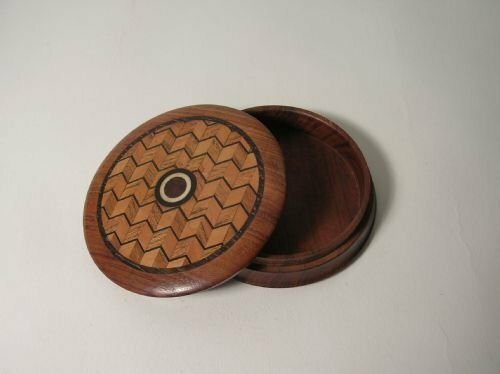 This box has a cube pattern parquetry lid with a tiny turned knob handle framed in an end grain mosaic border. 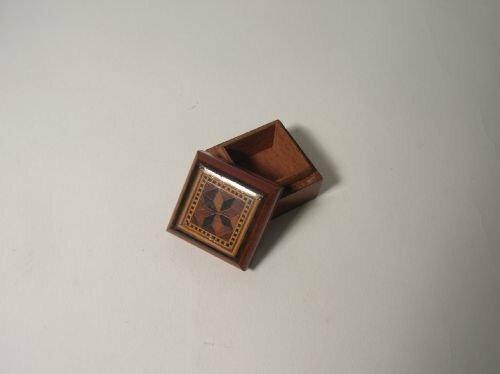 Part of a small collection of pieces pictured together in the last picture. 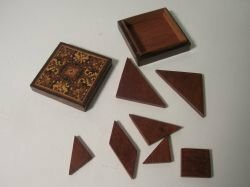 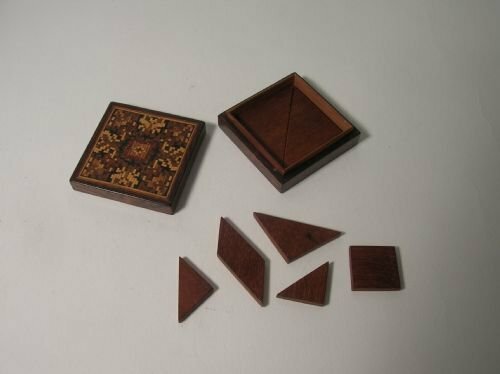 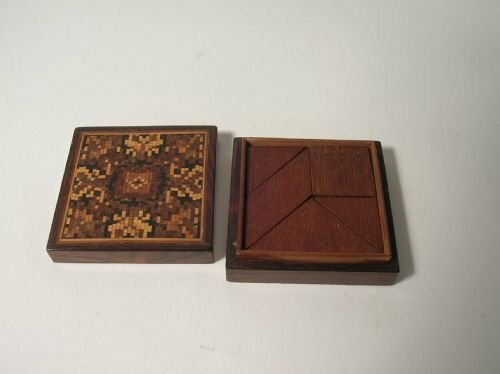 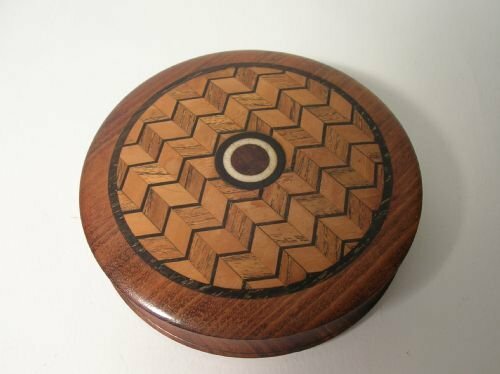 Pretty exquisitively crafted puzzle in a rosewood box, puzzle pieces made of mahogany, and an end grain mosaic lid with a geometric pattern. 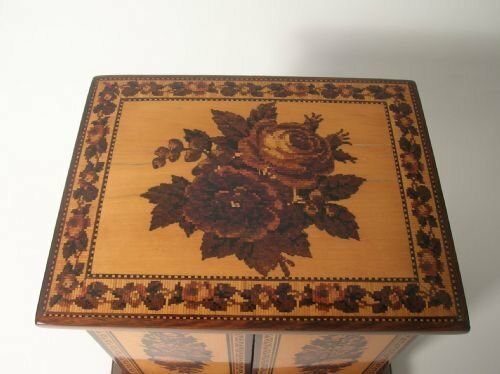 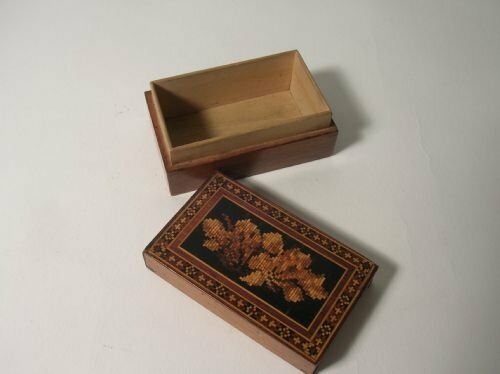 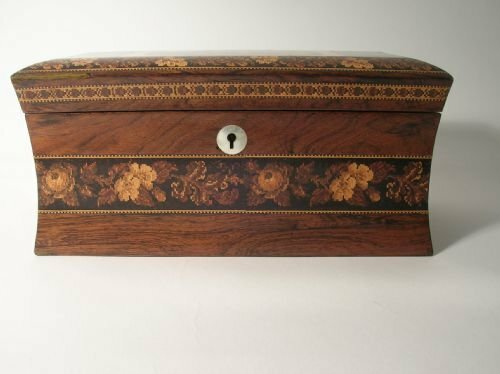 The lid is decorated with an end grain mosaic pattern of a bunch of flowers surrounded by a geometric border. 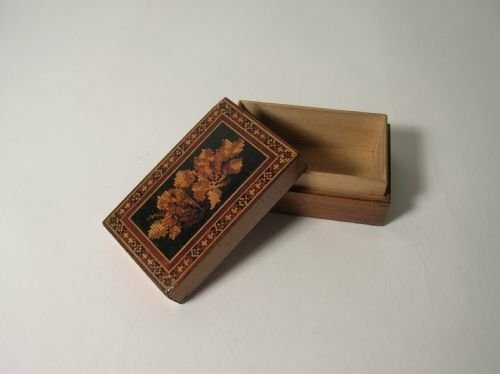 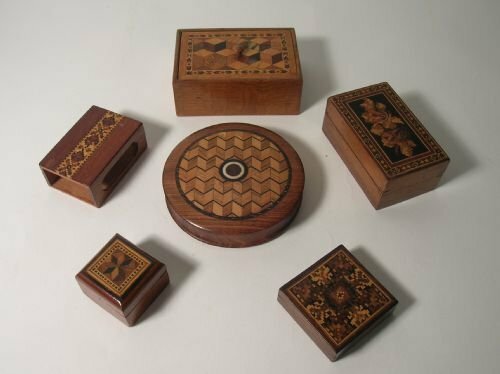 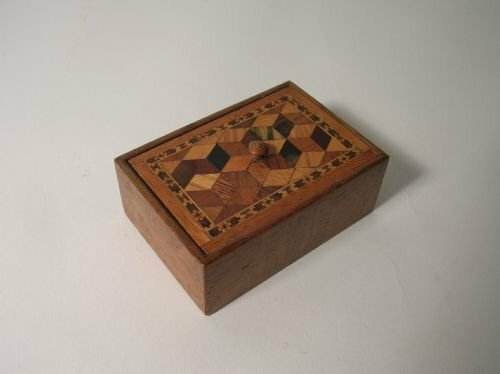 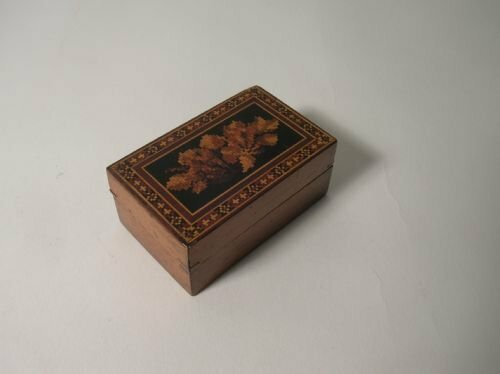 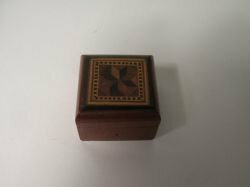 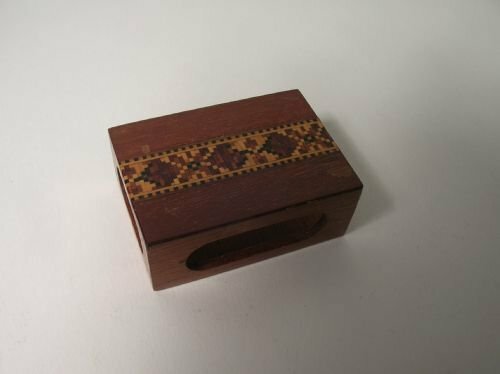 Decorated with a parquetry cube pattern surrounded by an end grain mosaic geometric border this tiny stamp box is exquisitely made. 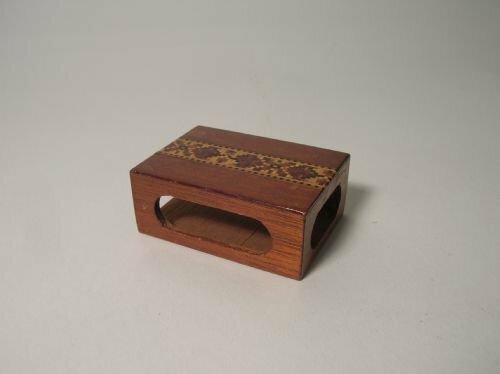 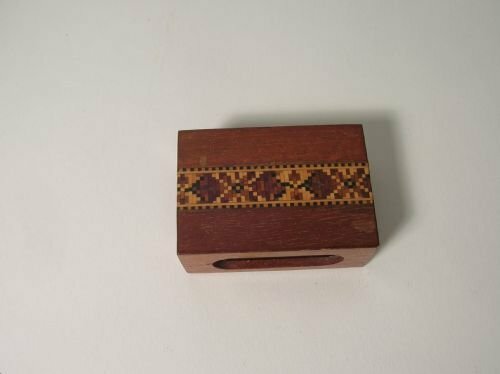 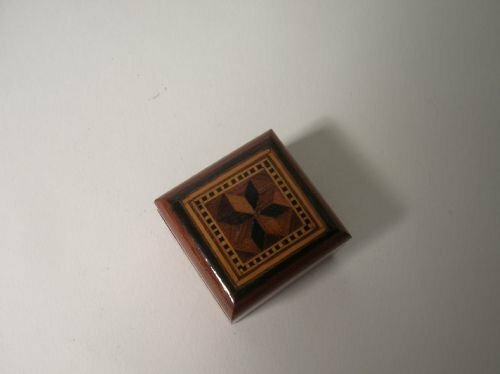 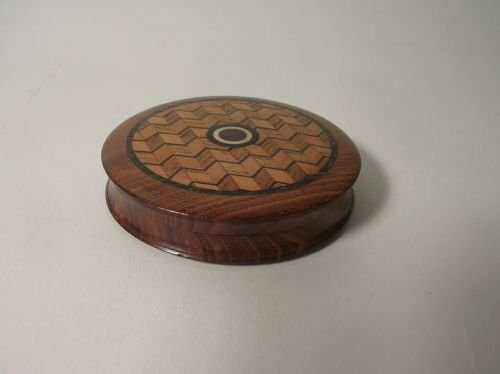 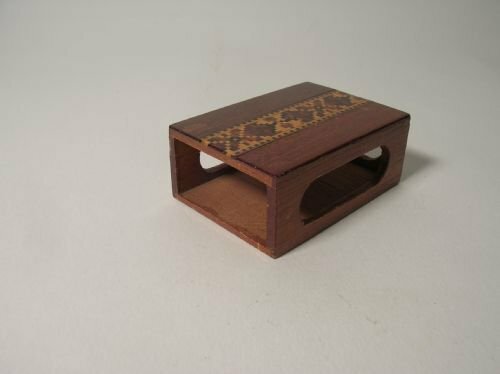 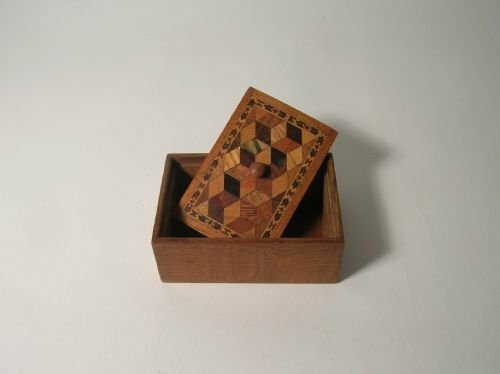 Decorated with an end grain mosaic geometric pattern this matchbox holder is a lovely little item.